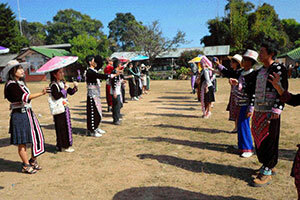 Ecotourism Village Moo 4 Ban Khun Khieen Watch Hmong lifestyle of Ban Khun Khieen, craftsmen and cultural traditions. For example, the Hmong New Year Festival and watch Wild Himalayan Cherry or sakura of thailand. Travel Traveling by car or motorcycle Take the path up Wat Phrathat Doi Suthep in about 1 hour.